A warming winter pudding, packed with festive flavours. For extra crunch, try adding some chopped hazelnuts to the filling. 1. Preheat the oven to 190ºC, gas mark 5. Halve the apples horizontally then, using a sharp spoon, scoop out and discard the cores, taking care not to pierce the apple skin. Remove some of the flesh so that a 1cm border remains to create a shell. Roughly chop this flesh. 2. 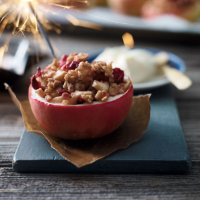 Add the cranberries, oats, marzipan and cinnamon to the chopped apple and stir together well. Stir in the melted butter and pile the mixture back into the apple shells. 3. Place on a large baking sheet and bake for 25 minutes until tender and golden. Serve warm with a dollop of yogurt or crème fraîche.